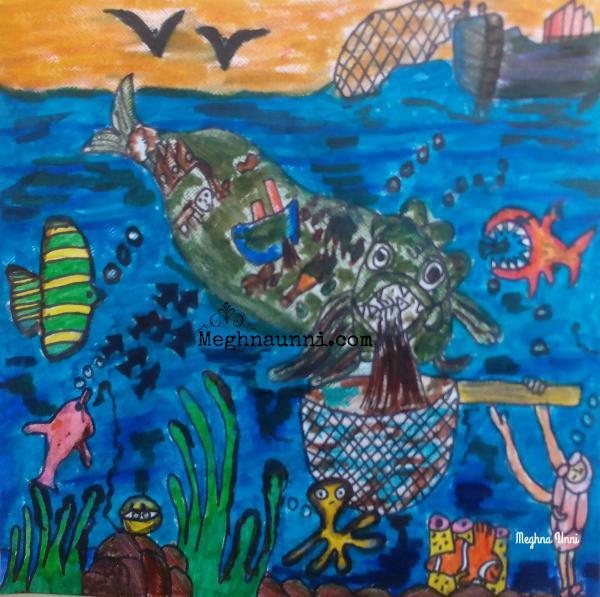 This is one of the old paintings done by me on Ocean Pollution and its effects on Marine Life. Drawn this when I was in 3rd or 4th std. Fish and other Marine Species ingest these harmful wastes from factories, shipwrecks, oil spills, plastic materials, causing it harm and loss of life. We, human beings, are solely responsible for this condition. We throw away everything which is not of use to us, into lakes, rivers and seas, making them inhabitable for marine species. Many species of ocean fish, octopus, coral reefs all go extinct and will affect us too in return. It is high time, we control these pollutions and save our seas and oceans. Otherwise, we are digging our own graves.